T A T L E R - dedicated to Scotties: Yum yum! En smak av tyrkisk yoghurt i en alder av tre uker og to dager! 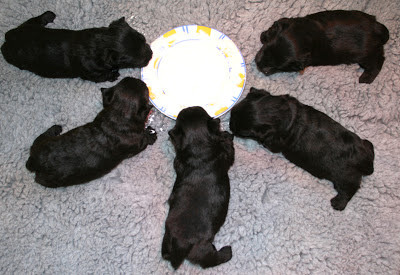 A taste of some Turkish yoghurt at the age of three weeks and two days! My litter will get their first food today too. It's funny how some of the take to it right away like they have been waiting for it all of their little life.